mLearnCon is fast approaching - June 15-17, San Diego, CA. When I first started working on the eLearning Guild's first event devoted to mobile learning I did what every 21st century researcher does...I googled it. Of course I had already been following the mobile learning industry for several years, but never with a focused objective. My search turned up Abilene Christian University over and over again. They were IT! Surely there were other schools dabbling with the idea of handing out ipods to incoming freshman, etc. But none of the others put themselves out there the way ACU did. That's BOLD! And I LIKE THAT! I'm thrilled to have ACU as part of mLearnCon. 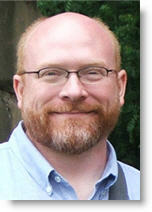 Dr. Bill Rankin is on our Advisory Board and brings many years of mobile learning experience to the event. In the spring of 2007, Rankin and a team of colleagues began work on the initiative that became "ACU Connected," ACU's ground-breaking iPhone and iPod touch-based mobile-learning initiative. Along with the other members of the ACU Connected team, he was named an "Innovator of the Year" for 2008 in the mobile learning category by Campus Technology magazine, and ACU's initiative continues to garner awards, most recently from ACUTA and Alcatel-Lucent. In 2009, Rankin was named ACU's first Director of Educational Innovation, an academic technology imagineering position designed to explore and develop new educational technologies and pedagogies. In 2009, he was also recognized by Apple Inc. as an Apple Distinguished Educator. I am also very excited to have Kyle Dickson on the program. Kyle is the Director of the Digital Media Center at ACU. Kyle will be presenting session 203 - Building a Mobile Vision: From Content to Collaboration. What ACU is doing with mLearning puts every other university way behind the curve. Because its not just "having an iPhone app". Yea, sure, there's an app for that. But engaging the student body in defining the project is what I think higher ed is all about. And the level at which the students were involved is truly impressive. No wonder U.S. News & World Report lists ACU as one of America's Best Colleges. Believe That ACU just received a funding from AT & T as well for mlearning. We have partnered with ACU before and actually went to on to develop a mobile Learning Platform (www.mobl21.com) to take mLearning to the next level.